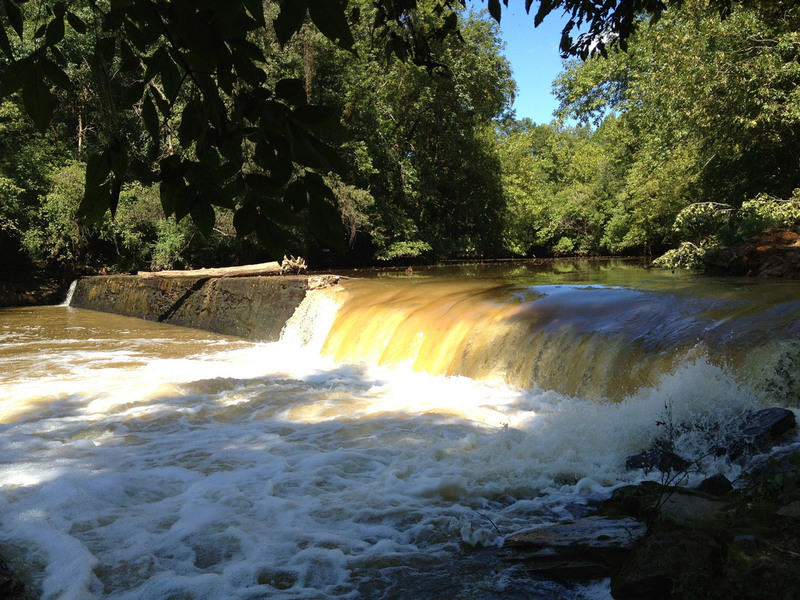 Lassiter Mill Dam on the Uwharrie, destroyed 9-4-2013 to open the river to the annual shad run. Before there were counties, before there were towns, before there were road names and 911 addresses, there was geography. In the past as in the present, local landmarks of whatever description oriented residents as to time and place, (how often do we say something like, ‘Turn left where the Hardees used to be”?). Before the advent to sophisticated surveying instruments, let alone aerial photography, satellite images and Google Maps, residents depended on their intimate and granular knowledge of local geography. This big rock or that big oak tree was known to be the corner between one landowner and his neighbor in the medieval English common law system inherited in the eastern United States, known as “metes and bounds” surveying. 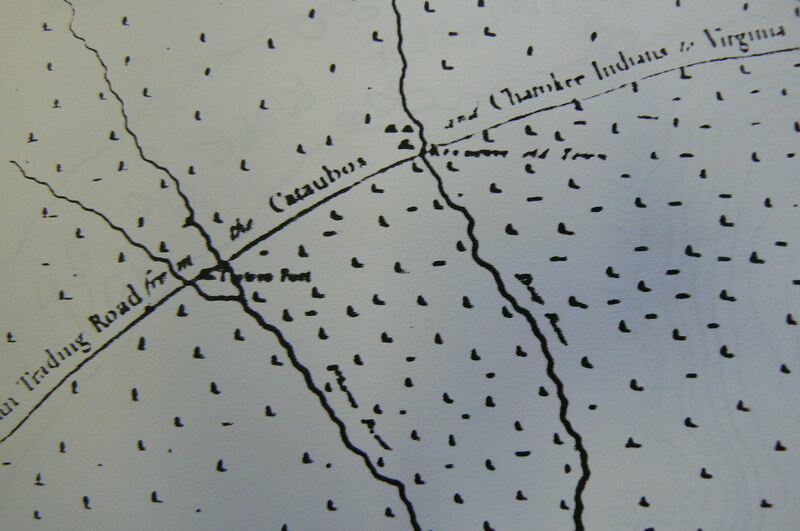 The Metes, or measurements, carefully established the unique directions, distances and calculated angles of the boundary lines; the Bounds, or terminal points, delineated the extent of the tract of land described. The Bounds also oriented the description in larger segments of time and place, from the largest to the smallest extent, with the growing recognition of political boundaries. A tract of land purchased by an immigrant could be located in North America (before 1492); the United States (1776); Carolana (1629); North Carolina (1691) ; Randolph County (1779); Asheborough (1792); Back Creek Township (1868). The natives and earliest explorers and colonists, of course, had few or none of these reference points. Dr. John Lederer (b.1644) a German immigrant and explorer, first travelled from Fort Charles, (now Richmond), Virginia into Carolana in May 1670. Lederer’s party of 20 white men and 5 Indian guides had dwindled down to just 4 people by the he returned to Fort Henry (now Petersburg, VA) in July 1670. But during that 90 day period Lederer had become the first recorded European visitor through Piedmont NC, all the way to the Catawba River near what is now Charlotte. His expedition journals were translated into Latin and published, forming the first guidebook for subsequent travelers. 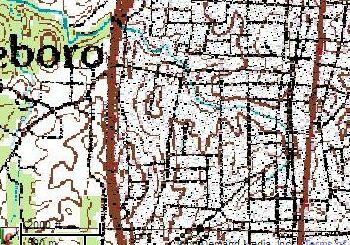 In the present era of satellite photographic maps from space, it is too easy to dismiss these early errors as stupid mistakes. It was a difficult matter in the 17th and18th centuries to track a watercourse from its source to the sea. The amazing thing to a historian is that local residents had in fact such an intimate acquaintance with each body of water that they knew where it flowed. Up until the Civil War, the most familiar landmarks of Randolph County were natural, physical, environmental distinctions of water, earth, wind and fire. Everyone was familiar with them, and every body of water, no matter how large or small, shallow or deep, had a name. Before there were county names, the name of the major local river was the primary landmark in any deed. “Waters of Deep River” sent the reader to the east side of what became Randolph; “Waters of Uwharrie” directed them to the west side. From 1752 to 1770, Deep River waters were in Orange County, St. Matthew’s Parish, and Uwharrie River waters were in Rowan County, St. Luke’s Parish. In 1770 parts of Orange and Rowan were combined to create Guilford County, which was itself divided in 1779 to create Randolph. 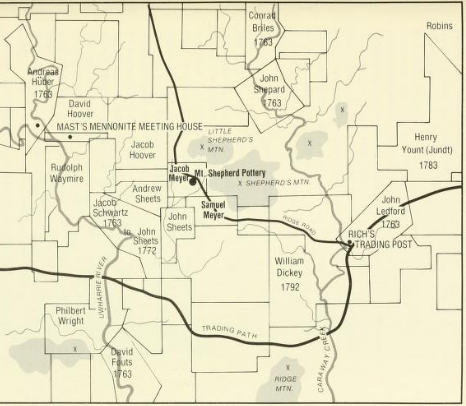 Each tract could be and usually was further subdivided to pinpoint the location: “Sandy Creek, waters of Deep River,” or “Caraway, waters of Uwharrie” indicated particular areas of each watercourse. Muddy Creek, Polecat Creek, Solomon’s Creek, Bush Creek, Sandy Creek, Gabriel’s Creek, Mill Creek, Brush Creek, Richland Creek- all are major tributaries (or “Forks” or “Prongs”) of the Deep. Little Uwharrie, Caraway, Back Creek, Bettie McGee’s Creek, Little River, are all major tributaries of the Uwharrie. 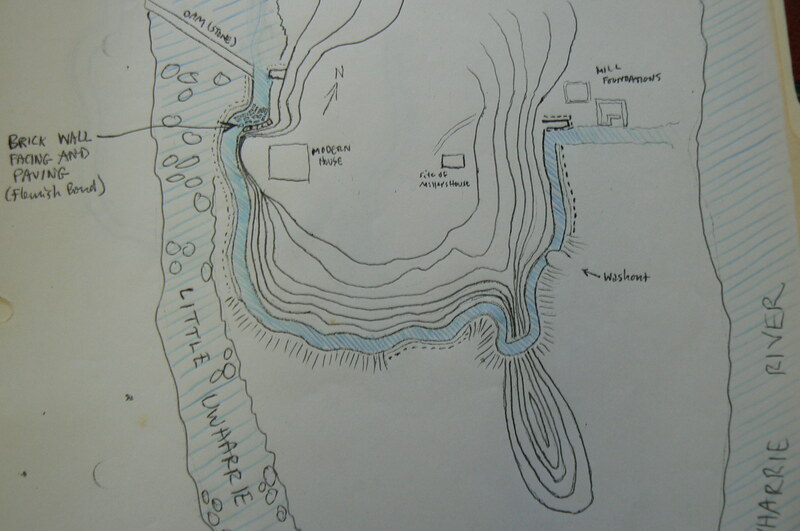 Each creek was further subdivided into numerous “Branches,” and each branch could be divided into “Runs” or “Brooks.” A “wash” or “draw” was a dry creek bead, only intermittently or seasonally wet. “Spring Branches” were the head sources of a watercourse, where natural springs bubbled up from the ground. These were highly sought-after pieces of property, and often a spring retained the name of its first owner long after that person had departed. “Adam’s Spring,” for example, is in New Salem, a tributary of Polecat Creek, and was the place where the doomed heroine of the ballad “Naomi Wise” met her alleged killer, Jonathan Lewis. “Mineral Springs” indicated that the water from a particular spring had dissolved substances that provided a particular taste, often thought to have healthful or healing qualities. “Hot Springs” were naturally heated, and were developed into spas and resorts. The smallest and most personal branches were those that began or “headed” on a homeplace, where the residents carried water for their animals and washing. 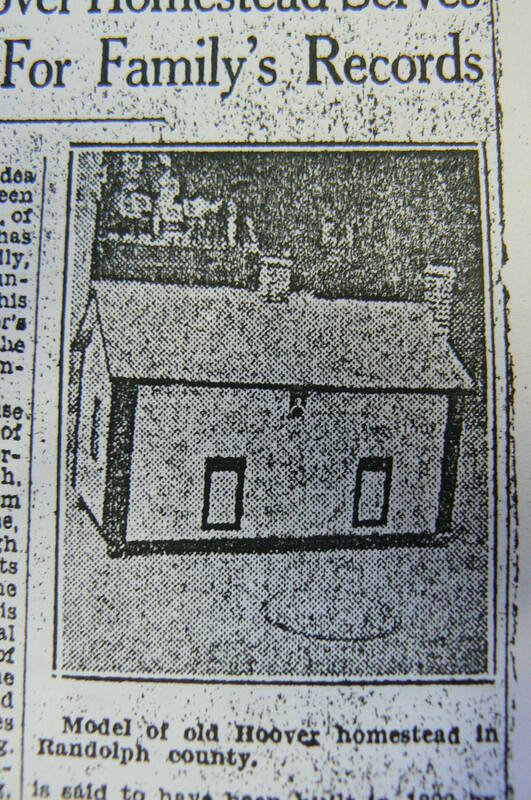 Sidney Swaim Robins (1883- 1979) wrote of his boyhood at 177 South Main Street in Asheboro that the branch behind his house was named after them, then their neighbors. “Below our place the Robins Branch became first the McAlister Branch, then the Penn Wood Branch, on its way to make Haskett’s Creek, which we used to cross on a covered bridge about four miles out on the road to Randleman. Of course we fished that creek all the way from Ed Walker’s line [now the site of Central Methodist Church, 300 S. Main at Academy St.] way down past “Eck’s” dam [unknown] to the place where Garland Pritchard grew up [647 E. Pritchard St., now an Acme-McCrary factory, but once Garland Lake Dairy]. We caught suckers, sun perch, catfish (after rains), now and then an eel, a few of them big enough to eat. I knew the small pond on the McAlister place to freeze over thick enough for skating only about three times in my real Asheboro years.” (Sketches of My Asheboro, 1880-1910, p. 2) The branch he describes now runs between Elm and Randolph streets, flowing roughly north toward Haskett’s Creek. 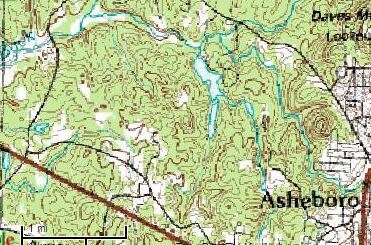 The point here is that the tributaries of Deep River were “heading” on the east side of Asheboro, and flowing downhill and northeast into the river. Whether Robins’ or McAlister’s or Penn Wood’s Branch, the stream that now flows along Elm and Meadowbrook started at a spring behind 835 South Cox Street in Asheboro, meandered its way into Deep River, and eventually flowed into the Atlantic Ocean through the Cape Fear River at Southport, NC. The 1851 Plank Road (now Fayetteville Street) followed the Ridge Line through Asheboro. 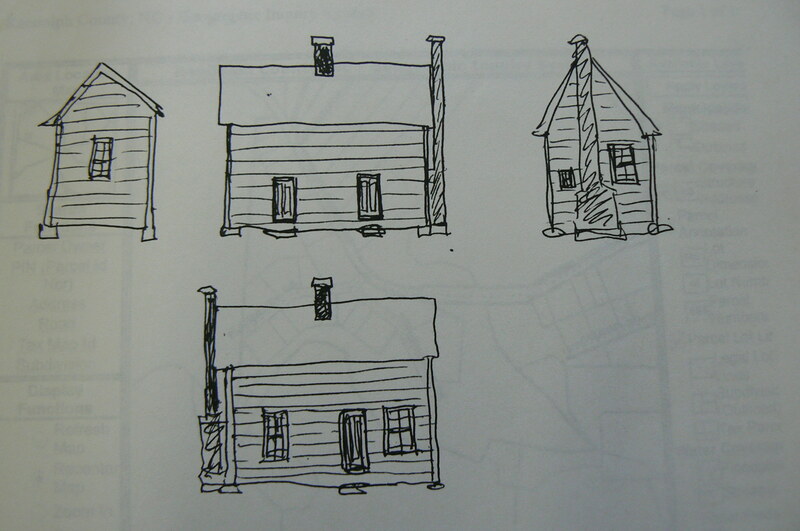 to in 1786 (Deed Book 2, Page 223); and Back Creek Township was established in 1868. 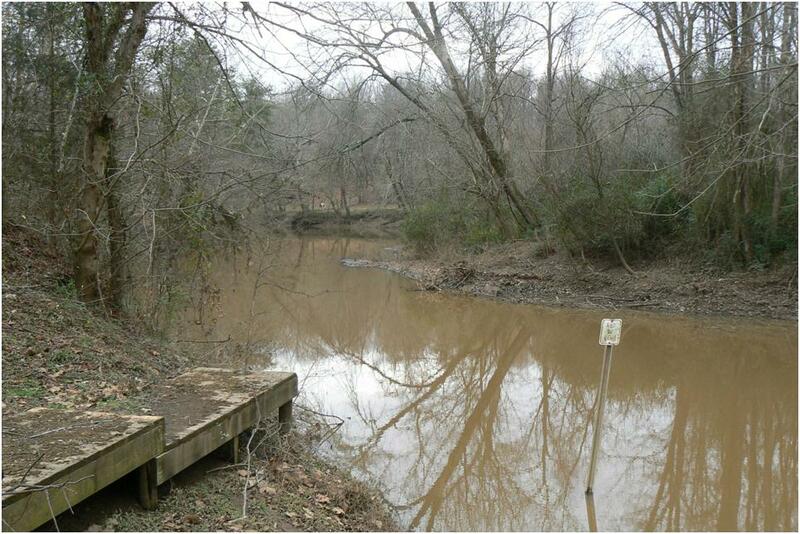 “Cedar Fork” is described as a tributary of Back Creek in a 1786 deed of Thomas Winslow (DB2, Page 230). Google Maps shows it as running between Bunting Road and Lexington, which would make it the major feeder stream from downtown Asheboro. The primary prong of Cedar Fork heads in the parking lot of the State Employees Credit Union, 1036 S. Park St., and then meanders northeast almost to the railroad track to the intersection of Cooper Street, Armfield Avenue and Hammer Avenue, where it turns northwest. From there it runs in a culvert under Memorial Park tennis courts, runs between Spencer Avenue and West Kivett Street; crosses Uwharrie Street at Occaneechee Street and then runs through a deep ravine to cross under the I-73/74 Bypass at Old Farmer Road, just south of East Street. It continues through the ravine at the end of West Street, and intersects another tributary of Back Creek just west of the dead end of Northridge Drive. The name of this second stream, which runs north from an area behind Klaussner Furniture, crosses Old Farmer Road at Register Street, and crosses Bunting Road running north, is not clear from any records I have seen. A third stream runs north parallel to the second from two ponds located north of Old NC Hwy 49 and south of US 64, west of Cranbrook Circle; this crosses US 64 just east of Westside Circle and flows north parallel to Jarrell Drive to the end of Bunting Road, where it enters Lake Bunch, one of the City of Asheboro’s original 1920s-era raw water reservoirs. Another, Lake McCrary, was created by damming a fourth tributary of Back Creek which heads north of Westchapel Road and flows north parallel to Westminister Court. Lake McCrary overflows into Lake Bunch, which meets the main prong of Cedar Fork near the dead end of Little Lakes Trail, just west of the intersection of a sixth stream, which runs south across Old Lexington Road from its source between Berkeley Lane and Viewmont Drive just south of Northmont Drive. The names of these six streams are currently not known with certainty, but could possibly be recovered from a detailed historical search of land titles. 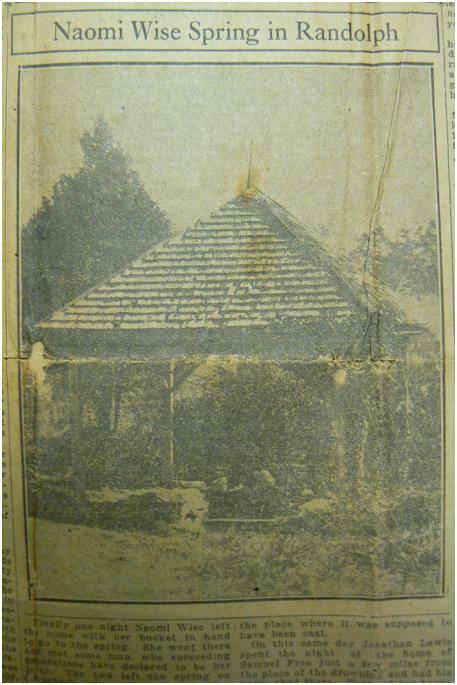 For example, the 1929 deeds (DB 234, P99 and DB250, P514)into Sulon Stedman who built a house at 745 Lexington Road (now Robert C. Shaffner) state that the property is bounded in part by Malley’s or Mallie’s Branch and Bunting Road- a large area which encompasses the main fork of Cedar Fork but could describe yet another branch (#7) which flows from the Episcopalian Church on Mountain Road, across Old Lexington Road and around the City of Asheboro Water Treatment Plant at the end of Bossong Drive to intersect with Cedar Fork. 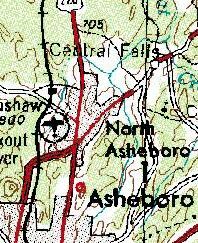 At the same time, however, there is still some confusion- one of the deeds (DV144, P258) into the City of Asheboro for the property which became Lakes McCrary and Bunch says that the land lies “where Cedar Fork and Mollie’s Creek unite, about 1 ½ miles west of the Town of Asheboro.” So, Mollie’s Creek or Branch could be either of the two tributaries (#3 and #4 above) which formed the old city lakes. For good measure, let me mention that yet another tributary of Back Creek was involved with the creation of a third Asheboro city lake, Lake Lucas. 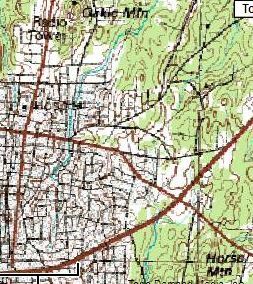 Lake Lucas was created in the late 1940s by damming Back Creek itself, but one of the acquisition deeds (DB 384, P499 and Plat Book 4, Page 77) refers to 16.35 acres bisected by Moulder’s Branch, “North of Maple Grove Dairy.” Most of the dairy pasture land is now under water, but the Maple Grove Dairy house itself still stands at 2882 Old Lexington Road. 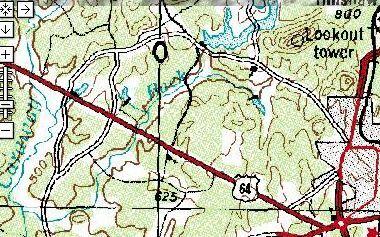 Since the head of the main fork of Back Creek runs north almost all the way to US 311, it may be that “Moulder’s Branch” is the tributary which runs west out of Back Creek Lake, crossing Lake Country Drive, Northmont Drive and I-73/74 to head just west of North Asheboro School Road, just west of Balfour Elementary School and North Asheboro Middle School. 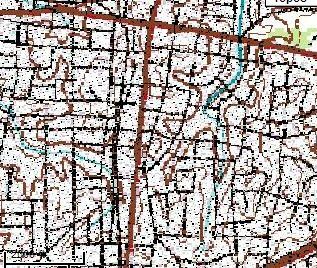 Every area of Randolph County could benefit from detailed analysis of historic deeds to determine the names of the neighborhood watercourses. This commonplace information has been lost to the present generation, which since the 1930s has been more concerned with automobiles, roads and street names than with geography. But Randolph County is rich with the forgotten history of water. Just tell your friends you know a shortcut that allows you to walk from the Pee Dee River to the Cape Fear River in fifteen minutes or less. 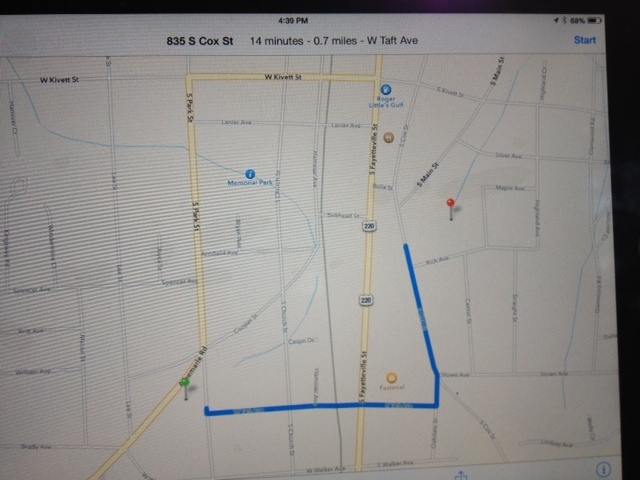 Then take them on a walk from 1036 S. Park Street to 835 South Cox Street. The walking route: Green Pin Pee Dee; Red Pin Cape Fear. Island Ford in Franklinville was an important ford on the prehistoric trade route south from the Great Indian Trading Path to the Pee Dee River at Cheraw, S.C. The trail, known as “Crafford’s Path” or “Crawford’s Road,” left the trading path near Julian and meandered south to cross Deep River upstream from the site of the Randolph Mfg. Company. Braxton Craven, born in the Buffalo Ford area but raised as an orphan by George Makepeace of Franklinville, wrote that the natives called the Island Ford “Threntauna.” See Braxton Craven, “Randolph in Olden Times,” Evergreen, Vol. I, No. 5 (May, 1850). Craven was the President of Trinity College, and The Evergreen was his rather self-conscious attempt at a literary fiction magazine. “Randolph in Olden Times” is part of a series titled “Fabulous History” which included Craven’s “Mary Barker” and “Naomi Wise” novelettes. Many of the facts given are notoriously unreliable; for example, 1688 is given as the date of Quaker settlement in the Holly Spring area! If authentic, “Threntauna” would be the only known record of any Indian language place name in the Franklinville area. 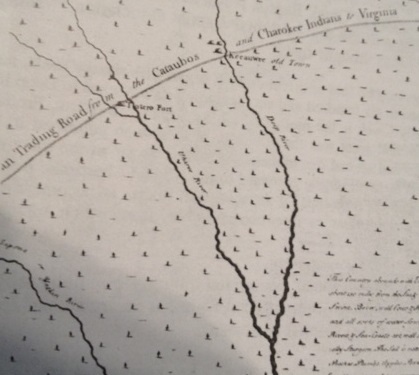 Indian names are hard to come by in eastern Randolph– settlers came in the 1730s and 40s, and the Indian names weren’t recorded (Not even Deep River has a certain aboriginal name– many sources argue it was called ‘Sapona,’ but Lawson calls the Yadkin ‘Sapona’ and doesn’t have any name at all for the Deep). The village of Island Ford was situated on the hill above the ford where Mulberry Street (now Academy Street) ran south down the ridge toward the river. The geography of the area has been so altered by the hands of men over the past 200 years that it is difficult now to decipher the prehistoric lay of the land. My study of the area has me believe that the actual ford lay just in front of, or under, the Lower Mill Dam. I believe this is so because the south bank of deep river is a steep bluff in all but a few spots in the Franklinville area. The area at the south end of the dam appears to be a place where the ford could have climbed the bank and followed the trail south toward Ogle’s Creek. The post card above shows the area about 1900, with Franklinville to the upper right (the farthest white building is Hanks’ Masonic Lodge, on its original 1850 site. Next to it on the left is the track of the “Factory Branch” of the Cape Fear and Yadkin Valley Railway, built into Franklinville in 1884. Farther left is the river road between Upper and Lower Mills, and then the river. What appears to be a long, narrow island at the lower left is actually the bank of the head race from the dam, built around 1846. No real island is visible in the area today; stone rubble in the river regularly snags driftwood, accretes a sand bar and sprouts trees, but nothing like the Island at Cedar Falls is present. The photograph below shows the same area during a flood in the early 20th century. The impoundment behind the Lower Dam was called “Marengo Bay” by early local historian Cornelius Julian (perhaps a reference to the 1800 victory that eventually made Napoleon the ruler of northern Italy). The dam was no more than a dozen feet high, and funneled a good bit of the river through the head gates of the power canal running diagonally across the foreground. The photograph below shows the modern view of the head gates and the dam, which washed out in a spring flood in 1984. 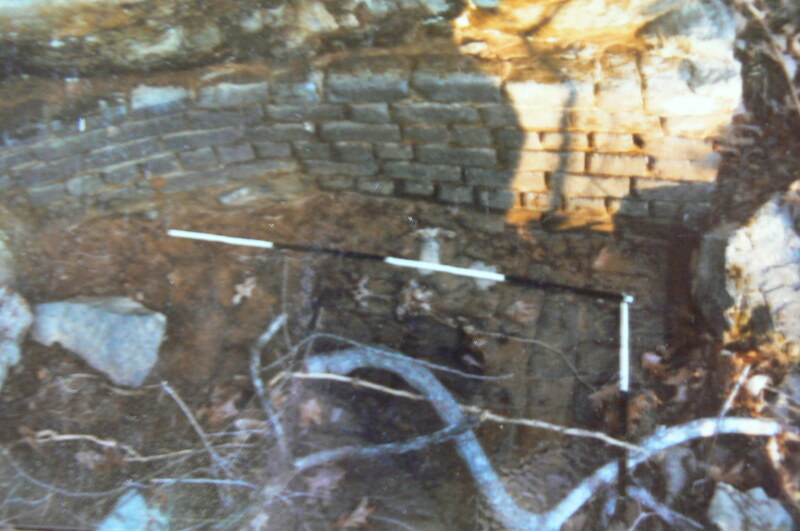 Here is a detail of the dam profile, showing the stone rubble core capped by concrete. You are currently browsing the archives for the Prehistory category.